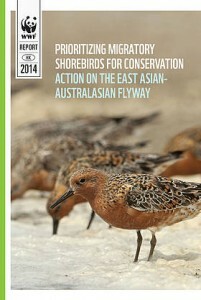 The report is an initiative for regional prioritization of the status of shorebirds using the EAAF, and is an objective assessment of the conservation status of EAAF populations using the latest available data on population size, trends, and distribution, to determine which populations are most likely to reach or approach extinction if measures are not taken. It is designed to stimulate and enable stakeholders in the EAAF to take actions that will effectively minimize further decline and loss of migratory shorebird populations in the flyway. Many shorebird enthusiasts in the flyway, including members of the Shorebird Working Group, contributed to the report through the donation of personal records, data checking and reviewing drafts. For further information please contact Mr. Bena Smith, Conservation Manager – Regional Wetlands, bsmith@wwf.org.hk.